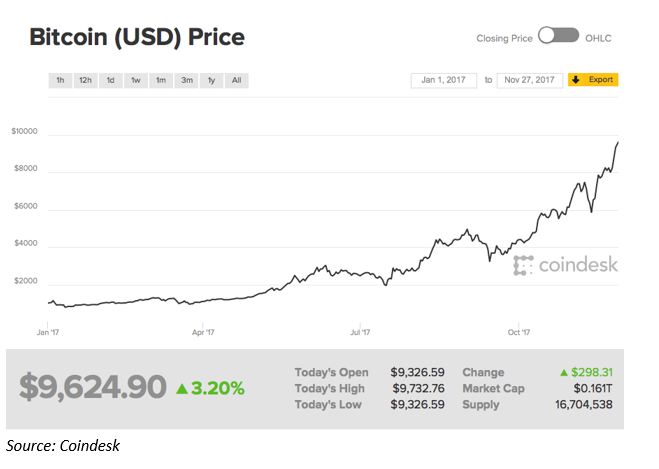 The price of bitcoin is surging, rapidly approaching the $10,000 threshold. In Monday morning trading, a single bitcoin was trading at $9,624. The recent price marks a 1,000-point move within the last week. Meanwhile, year-to-date gains of 864% have surpassed even the most optimistic expectations. Go here to access my first-ever Bitcoin event (it’s FREE). Bitcoin’s valuation now stands at $161 billion. That makes the cryptocurrency more valuable than some of America’s biggest companies, including McDonald’s (NYSE: MCD), Walt Disney (NYSE: DIS) and General Electric (NYE: GE). Bitcoin is moving so quickly that even the crypto’s biggest promoters are having trouble keeping up. For example, a fund manager named Mike Novogratz offered his latest bullish outlook for Bitcoin on Bloomberg TV. Novogratz is well known in hedge fund circles as the founder at Fortress, a $72 billion fund. Just six days ago, he set a new target price at $10,000. At the time, bitcoin was trading at $8,400. One week later, bitcoin is closing in on his aggressive target. Novogratz is now raising $500 million for a new hedge fund called the Galaxy Assets Fund. He’s personally investing $150 million of his savings in the fund, which will invest in cryptocurrencies and companies in the sector. Back in late 2015, Novogratz invested in a crypto called ethereum or “ether.” Investing $500,000 at less than $1 per bitcoin, he quickly earned $250 million in profits as the crypto surged above $400. Folks who are buying bitcoin and ethereum today are speculating on rising prices. It’s a bet that another investor – in the future – will be willing to pay more for the same exact asset. In addition to investing directly in cryptos, some smart investors are betting on companies that operate in the sector. One of these companies is a bitcoin mining company (click here to learn more). And it’s actually getting ready to “go public” in an initial public offering. In tomorrow’s issue of Daily Profit, I’ll explain what bitcoin mining is and how it works. In the meantime, be sure to confirm your spot in this week’s LIVE bitcoin webinar. Just click here for instant access.